"I want to build a Star Wars costume, but I have no idea where to begin!" There's no right or wrong way to begin a costume build, but there are two key factors that will determine which costume you can make- body type and budget. Once you figure out both of those factors, you'll be ready to move onto the next phase of creating a costume. First and foremost, The Dorky Diva is a non-discrimination zone. This segment will not be criticizing shape, size, or anything that makes you special and awesome. Each body is different and beautiful in it's own way! With that being said, body type is a really important topic to discuss when choosing a costume. It's imperative that you understand your proportions and curves to know what costumes will fit you and which costumes may need to be modified. For example, a fully armored costume (stormtroopers, clone troopers, etc.) would not work for my body type because I am not tall enough to have accurate proportions. My short torso and legs don't leave enough room for the chest plate, ab plate, thigh, and shin armor of a fully armored costume to fit properly together. Here's a little cheat sheet to determine if you're a good candidate for a fully armored costume. If you're in the 5'8" and under category and still want to create a costume with armor pieces, consider characters like biker scouts, TIE pilots, Sabine Wren, and Boba Fett. All of these characters have helmets, chest armor, and other armored pieces on their body while still mixing in a flight suit or under clothing of some kind to flex with their shape. Fabric costumes are much easier to tailor than plastic or fiberglass armor. If your heart is totally set on having a fully armored costume even though you are on the shorter side, be prepared to modify most or all of your armor pieces to fit your size. I chose to build a shadow scout because the mix of fabric and armor is a great way to work with irregular body proportions. The costume is a full body flight suit with armor attached over it. I was able to tailor a child's extra large flight suit to fit my smaller torso and I reshaped the chest piece to fit snugly against my skin. After weeks of modifying and trimming armor, I was able to make this costume fit me and look proportionate to my height. Unless I'm standing next to people much taller than me, it's really hard to tell that I'm only 5'2" in my costume. Don't get discouraged if you aren't the perfect size for the character you'd like to replicate. Nothing is truly impossible. There are always ways to modify pieces of your costume to fit your curves. I will touch upon how to modify armor to make it smaller or bigger in a future post. 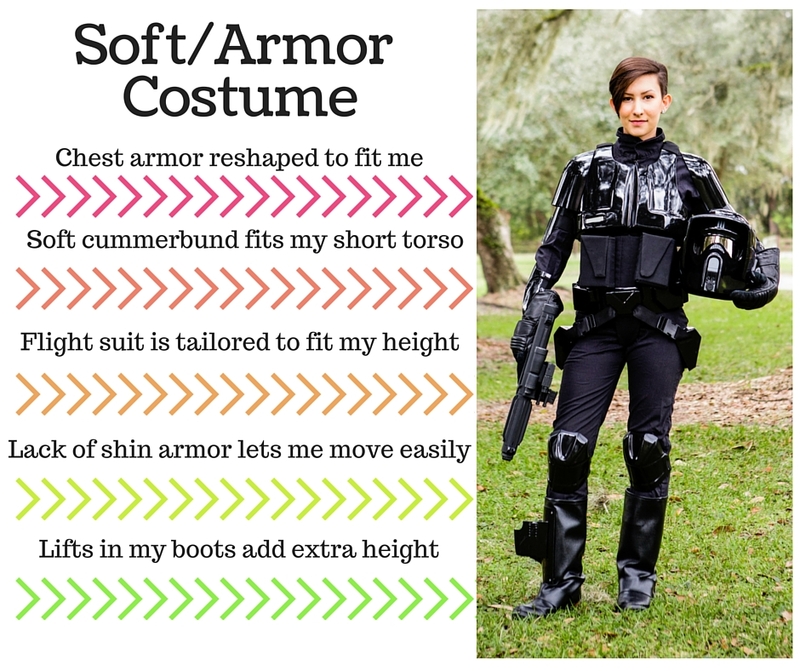 For now, consider your body type and how it will affect the way you build your costume. Ahhh, money. Hard to obtain and even harder to spend! Sometimes I get blank stares when people ask how much my costumes cost, but that shouldn't scare you away from creating your own. Some Star Wars costumes are crazy expensive and others are much more affordable. 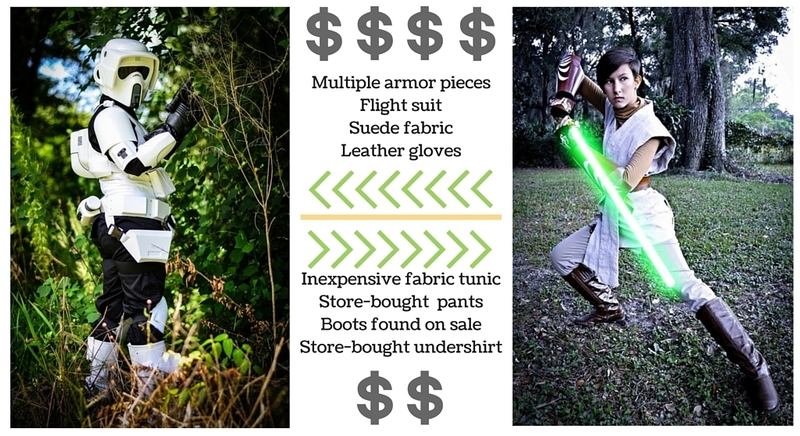 There's no magic number or answer for the least expensive Star Wars costume because it all depends on how much of the costume you can create and how much you will have to pay for someone else to create. Assess your skills. 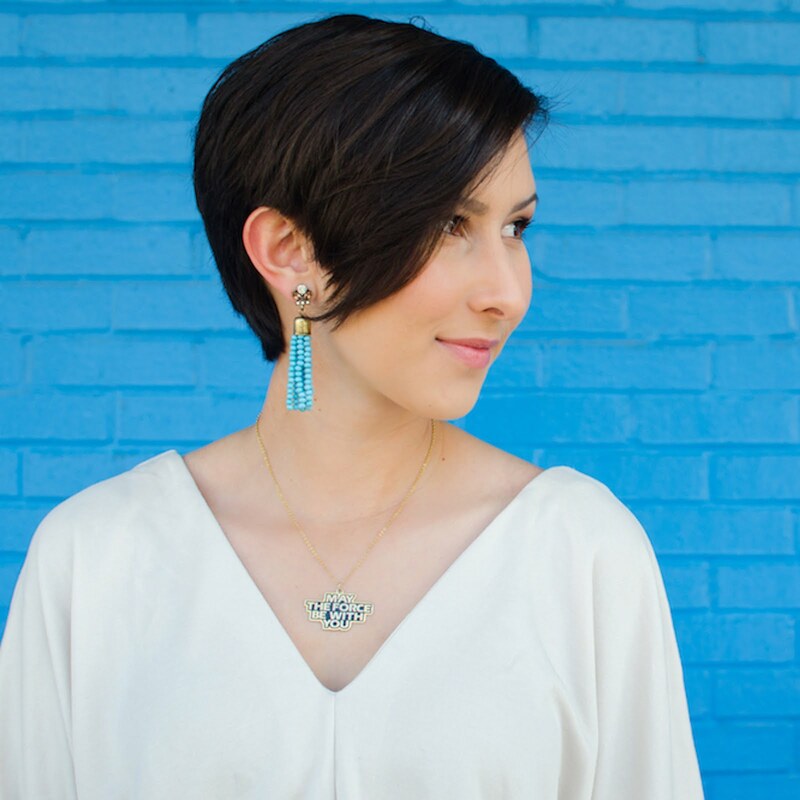 Can you sew, paint, glue, or sculpt? Do you have any friends that are talented in these areas and would help you? Hiring someone to paint a clone trooper costume could cost a couple hundred dollars, but if you or a friend can do it, that would save a good chunk of money. 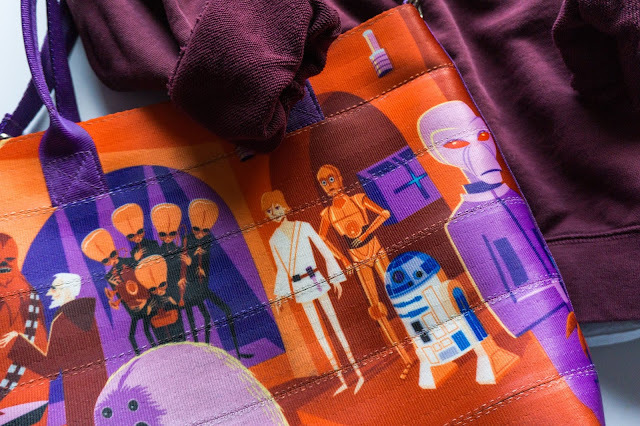 Taking a few beginner sewing classes could help you a great deal if you need to sew a shirt, pair of pants, or simply tailor a piece of your costume. More detail equals more money. If you want more accurate details on your costume, it will cost more money. For example, if you're making a Rey costume, but don't want to spend $200 on the screen accurate boots, you could easily find a similar pair for around $40 at the mall. Characters like Boba Fett with tons of small details on their outfits will always be more expensive than characters like Jawas that are very simple and plain. Research what materials are needed to complete the costume. Will you need to purchase expensive materials like leather, fur, or metal? These items would make your overall costume budget skyrocket. You can estimate the overall cost of your costume by researching what materials are necessary to build the costume. Search for cheaper duplicates to lower the cost of your budget. Faux leather, faux fur, and less expensive fabric choices can save you significant amounts of money. Be aware of hidden costs when purchasing kits. For example, a kit of unassembled stormtrooper armor may only cost $600, but you'd still need to buy under armor, boots, snaps, elastic, glue, and paint to complete the costume which could add up to an extra couple hundred dollars. It's always a good idea to get your feet wet in the world of costuming with an inexpensive costume. After creating your first one and wear the finished product, you'll feel more comfortable investing money into a more detailed costume. Jedi, Jawas, and Tusken Raiders are examples of Star Wars costumes that are comfortable, fun to wear, and inexpensive (ranging from $100-$300). Some of the most expensive costumes in the world of Star Wars include Darth Vader, Boba Fett, Zam Wesell, and Boushh Leia (ranging from $3,000 to $6,000). These costumes are steep in price because of their intricate helmets, leather pieces, small details, and custom-designed armor. These are great costumes to work on after creating your first few costumes that are a little more simple and less expensive. 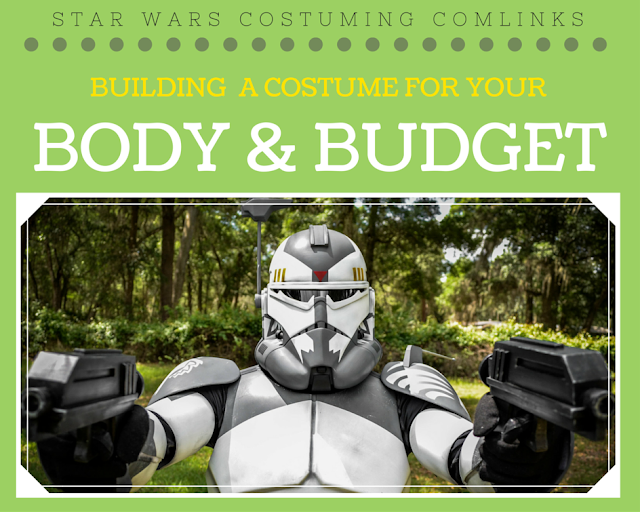 Hopefully this post gave you a better idea of what to look for when you're choosing the right costume for your body type and budget. If you have any questions that I didn't cover, please leave a comment below, email me at savannaakiefer@gmail.com or shoot me a tweet @Savanna_Kiefer. Great post!! I think over often overlooked costumes that work well for various body sizes are the tuskens and jawas - I am building a Jawa now!! I am with you on making the check list and spread sheets!